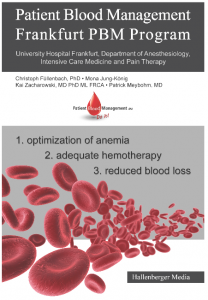 To summarise the clinical concept of Patient Blood Management, the PBM Network Coordination Centre published an eBook in a joint approach with collaborators from the University Hospital Frankfurt. In the first instance, the eBook addresses healthcare professionals as well as hospital management employees. Nevertheless, for anyone interested in the topic the eBook presents a brief and profound overview. A revised version was published in 2018 and can be order via Amazon, Apple, Thalia, Weltbild, Kobo, Google Play and Barnes & Noble.